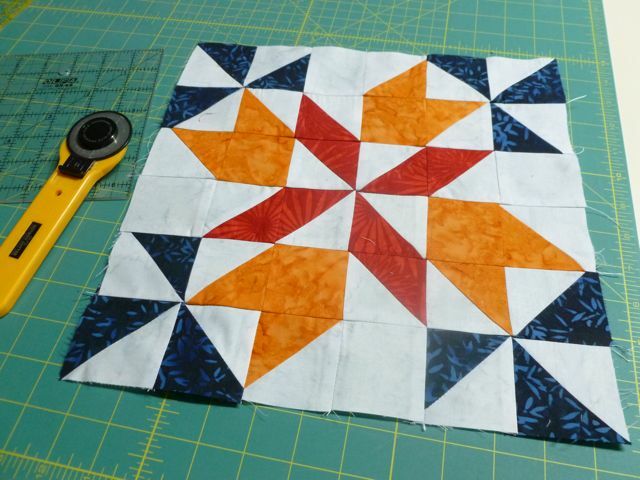 The original pattern has a dark blue background which will change to light grey. The light grey will be blue. The red and orange stay the same, but let me warn you this is really easy to mess up! 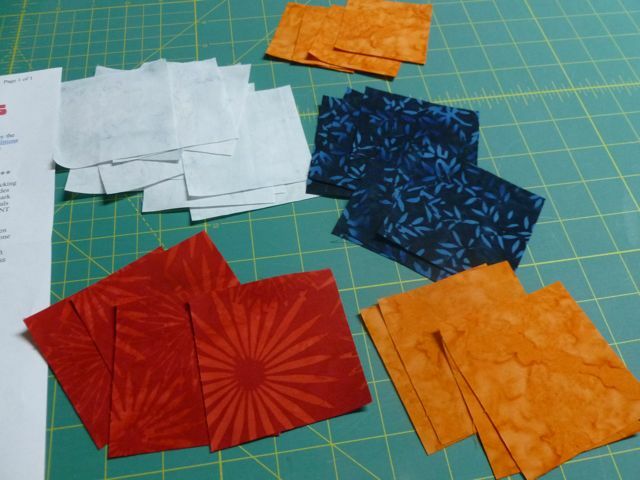 Once again, I do not like the strip method of sewing HSTs, it is too much start and stop, turn the fabric this way and that. 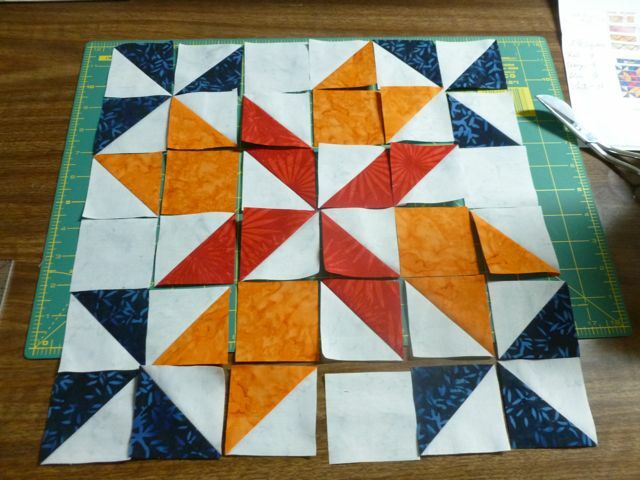 So, ignore the cutting directions and cut these – 2-1/2 squares, four of orange, and four of white. 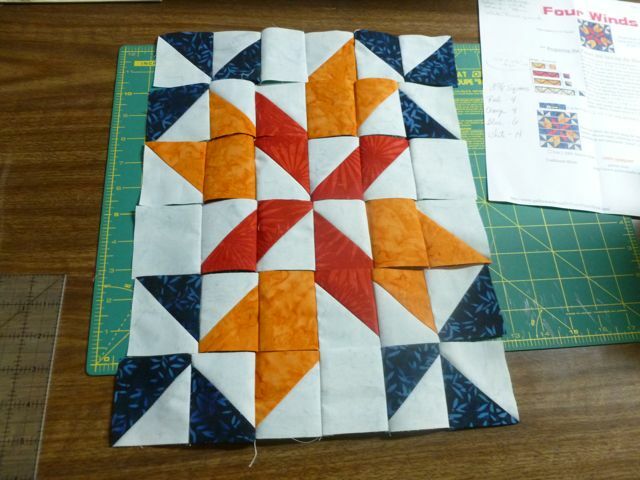 Cut 2-7/8 inch squares in the following quantities – 4 red, 4 orange, 6 blue, and 14 white/grey. Pair up the white/grey with each of the 2-7/8″ colors. Mark your diagonal lines like we have done before. 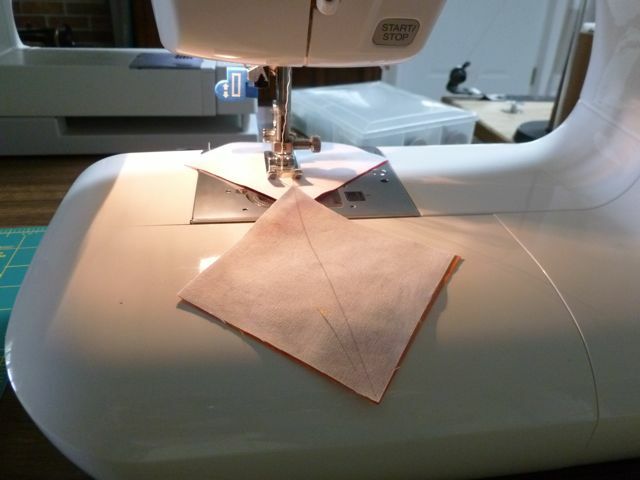 Sew the HSTs. 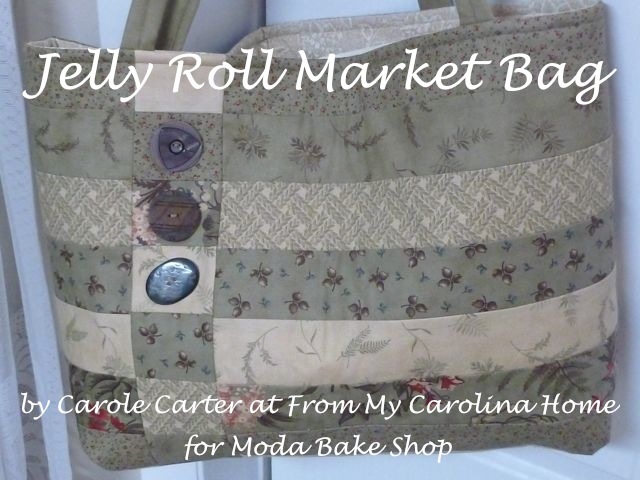 Flip them to the opposite side of the marked line and run them all through the machine to get the other side sewn. Then cut on the line. 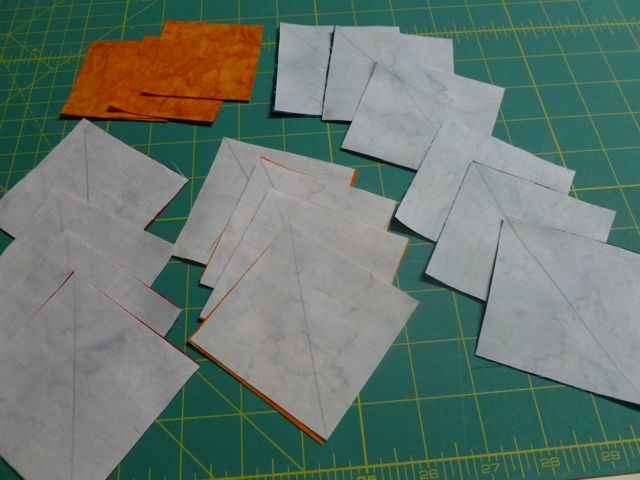 Iron them all open with the seam towards the darker color. Then square them up. If you need a refresher, click on How To Square Up A Block. Remember that the blue in the pattern is now grey, and the grey is blue. So lay it out. OK, think that is good. 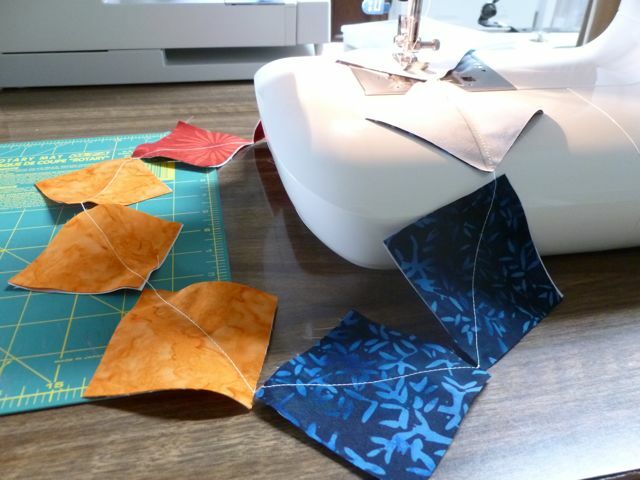 Sew the pieces together in twos, then lay it out again. 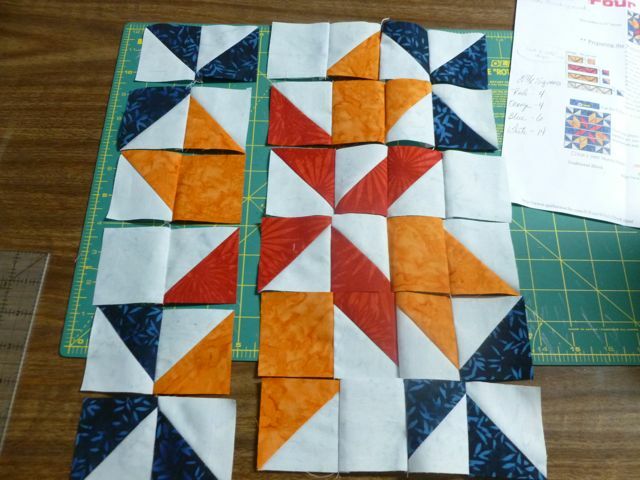 Now do two sets of two in rows. I started on the right. 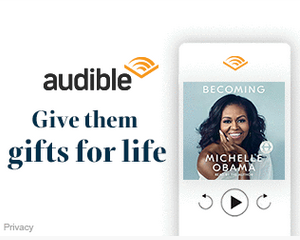 Add the other set of two to each row and lay it out again. 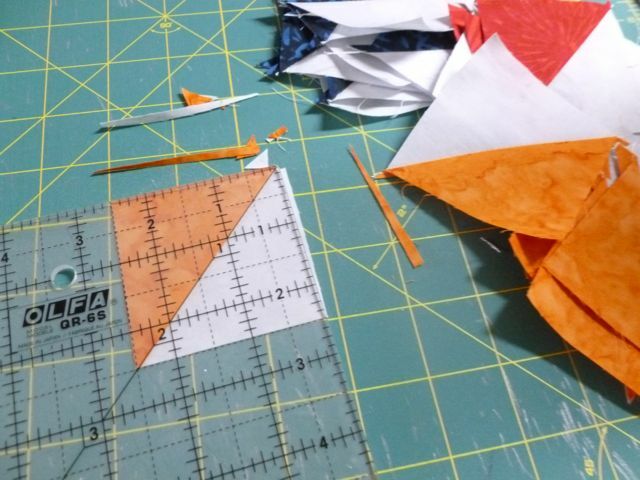 Pick it up with the rows in order and iron the seams opposing, so you can nest the seams for more accurate piecing. 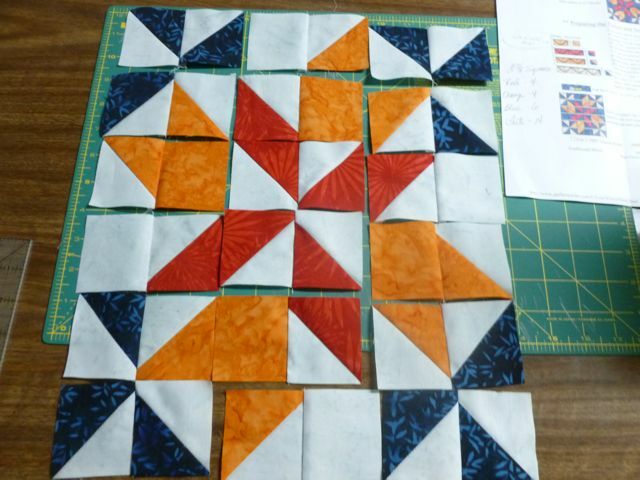 Lay it out one more time and sew the rows. And that’s our Block of the Month for May. See you next month! 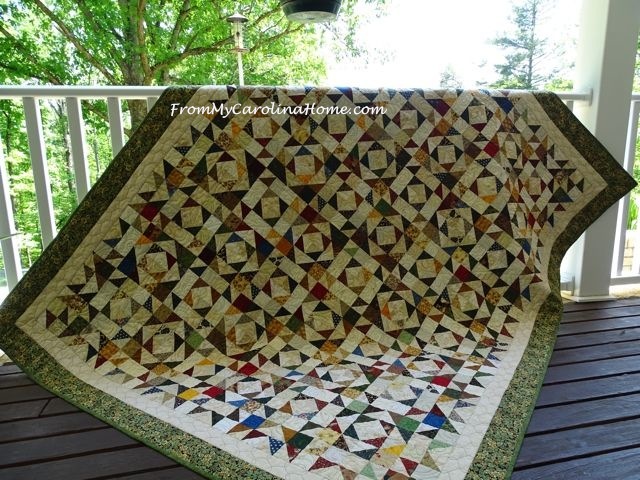 Since it is almost all HSTs, I’m also sharing it over at Vicki Welsh’s Field Trips in Fiber HSTeria. It is always tough to make subtle changes, so I really appreciate your repeated reminder to lay out the blocks and make sure you are happy. 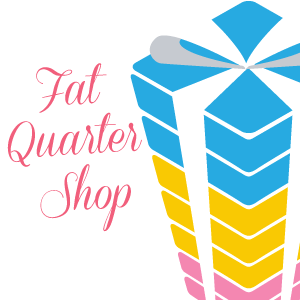 Kind of like measure twice (or more!) and cut once! Yes it is, I have to lay it out or for sure I will mess it up and have to rip-it, rip-it!! Thanks, Patch, but I didn’t choose the colors. 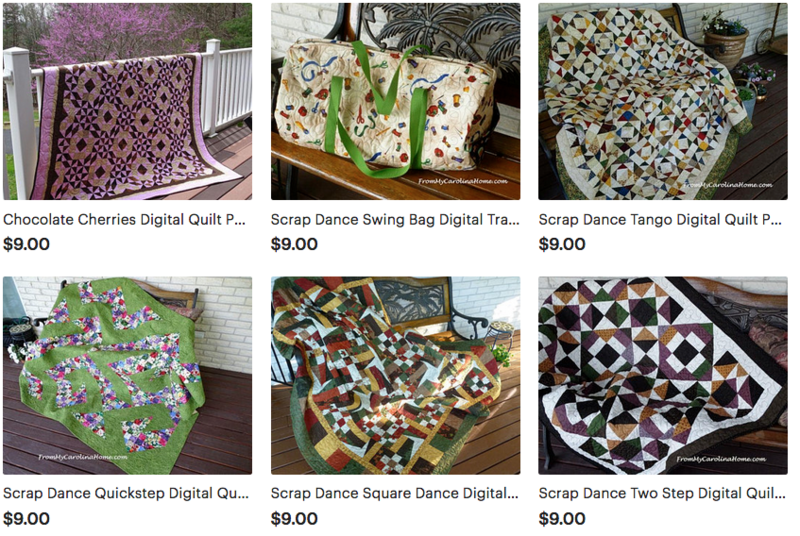 This is a $5 BOM from my LQS, and they choose the fabrics. 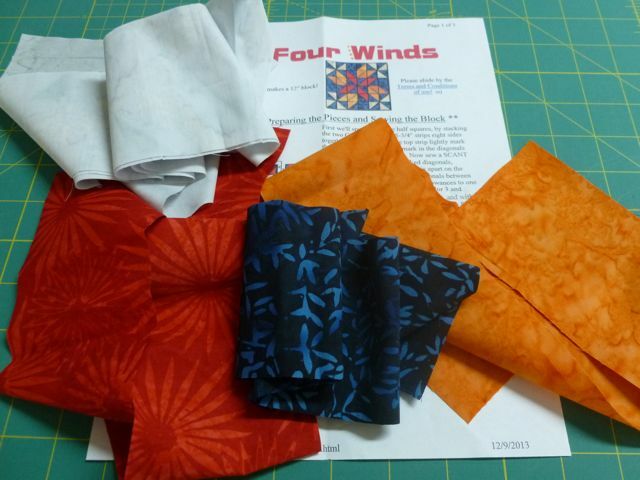 I choose the batiks colorway so I could try out batiks. Hi Connie, I didn’t like them at all when this first started, but the puckering problem seems to be solved. I am still on the fence, I think I prefer the traditional cottons better. But, will continue working with batiks through the year and see what happens. Such a beautiful block. You did great putting it together. I appreciate that, Jasmine, will be doing BOM all year. 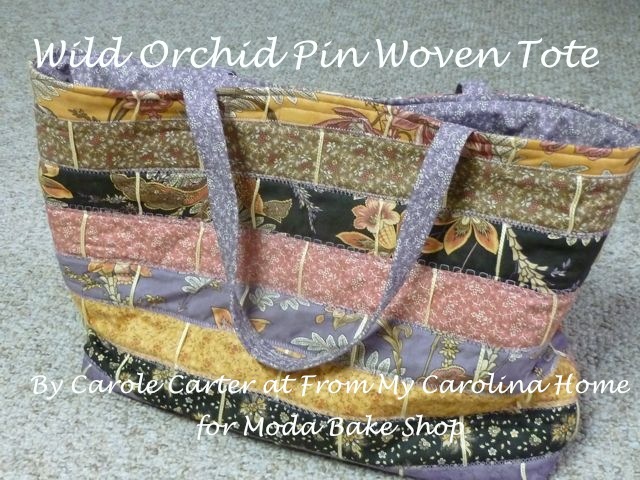 Hope you will come back for the next one and sew along. Thank you, Cornelia! I am having a lot of fun with these. What a sweet block. 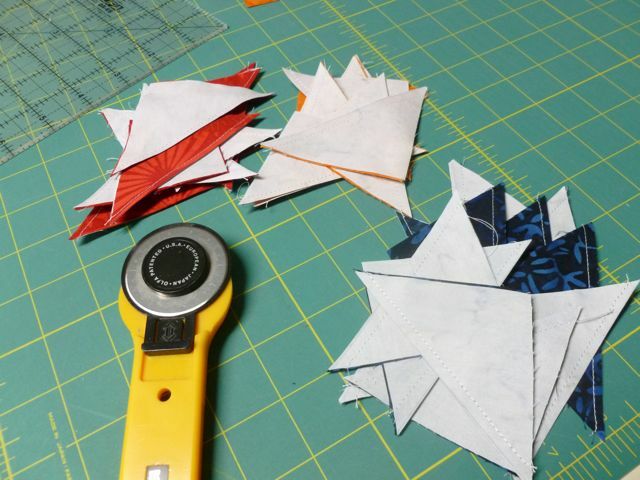 I use your method for making hst’s, too! 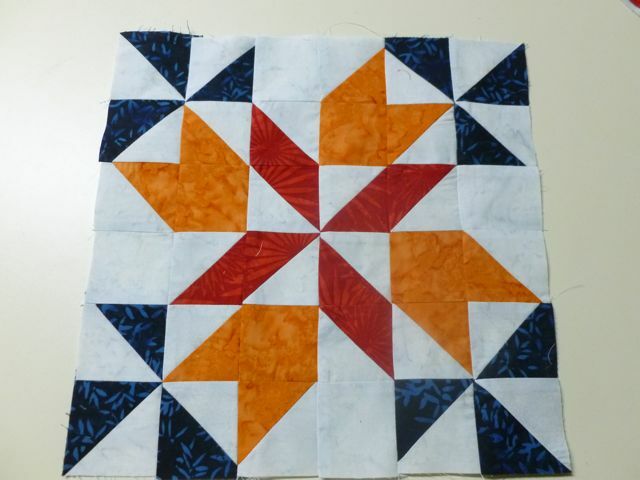 I enjoyed seeing each step of your process and the finished block looks great! Thanks, Lorna, my points are getting sharper with practice. 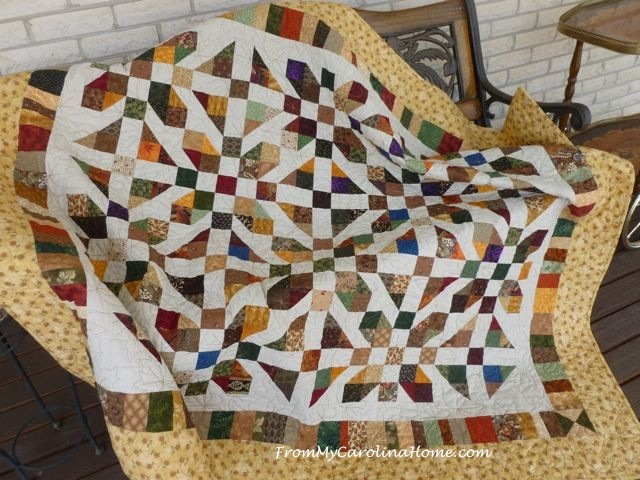 Such a beautiful block, and those fabrics are gorgeous! Thank you, but the real credit goes to Elaines Attic who is hosting the BOM. I am having a great time trying batiks for the first time.